I am very proud to have iced a cake for the soldiers recovering at Headley Court. Headley is just 5 minutes away from where I live. Headley Village is very pretty, there is a beautiful Heath which is a favourite place for us to walk the doggies, and Mr S and I go to Headley Clay Pigeon Shooting Club, so its an area close to our hearts. Added to all the above, it is home to Headley Court, where seriously injured soldiers go to recover and learn to re-build their lives. So when the local British Sugarcraft Guild announced they were going to supply Christmas Cakes to the soldiers at Headley I was so pleased! The people at Headley Court spoke to the representative from the local British Sugarcraft Guild group and asked if the soldiers could have cakes for Christmas. 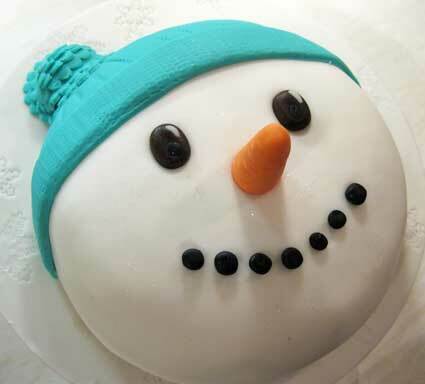 The idea is that eveyone at the group supplies an iced Christmas cake which will be taken along to the Hospital for the soldiers to enjoy. I’m new to the British Sugarcraft Guild, in fact I’ve only actually been to 2 meetings so far and tomorrow evening is the last BSG meeting before Christmas. So it will come as little surprise that this weekend panic set in! The other ladies at the British Sugarcraft Guild are true cake artists……they make teeny tiny flowers, beautiful bouquets, all out of sugar paste. I, on the otherhand, do not!! What on earth was I going to do? I could fake it and buy one….but would I get found out? I could blag it and not take one…saying I’ve just been too uber busy to get one done. I could miss the meeting completely…………. But then, Mr S came up with a great idea. What about a snowman?!!!! Perfect shape, and a simplicity of design that can’t help to be a winner, and best of all, no intricate pieces for me to muck up. Genius!! Therefore, it just leaves me to wish the heroes at Headley Court and in all our armed forces a very Merry Christmas!!! !